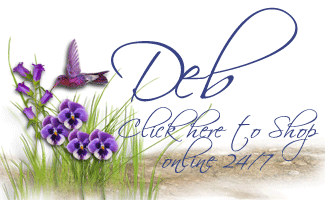 Creation Station Blog Tour – Birthday Celebrations! Welcome back to another Blog Tour with the Creation Station design team! On this tour, our theme is Birthdays. The team has the option of showcasing the stamp sets Celebrate Today or Big Day, but since I don’t have either of those sets, I’m just going to stay with the theme, and use some different stamp sets! (I know – hard to believe that I don’t own every stamp set in the catalogue – many of my customers think that I do – but it’s true!!). If this is your first time joining us – Welcome! The Tour is very easy to follow; each blog is linked in a circular fashion, so whether you click ‘next’ or ‘back’, you will travel through all of the design team’s blogs. There is also a list of the participating members at the bottom of this post; you can simply click on the link, and go directly to their page if you wish. If you’ve been following in a forward fashion, then you’ve arrived here from the talented Jennifer Downey’s blog – didn’t you love her projects?! If you’ve been traveling backwards, then you’ve just come from seeing the amazing creations of Jen Arkfeld. I decided to share one of the awesome stamp sets that I received at Leadership convention – it’s called Balloon Bash, available in photopolymer with 8 stamps in the set. It’s very cute, and while the sentiments are specific for birthdays, you can use some of the other images for other celebration cards. I cut 1/2″ wide strips of the confetti looking piece of dsp, and alternated them on the card base of Bermuda Bay card stock. I layered the tag on top using Stampin’ Dimensionals, then scattered some gold sequins from the Gold Sequin Trim. Perfect for a ‘little something’ gift is our Mini Gift Bag Thinlits Dies set. 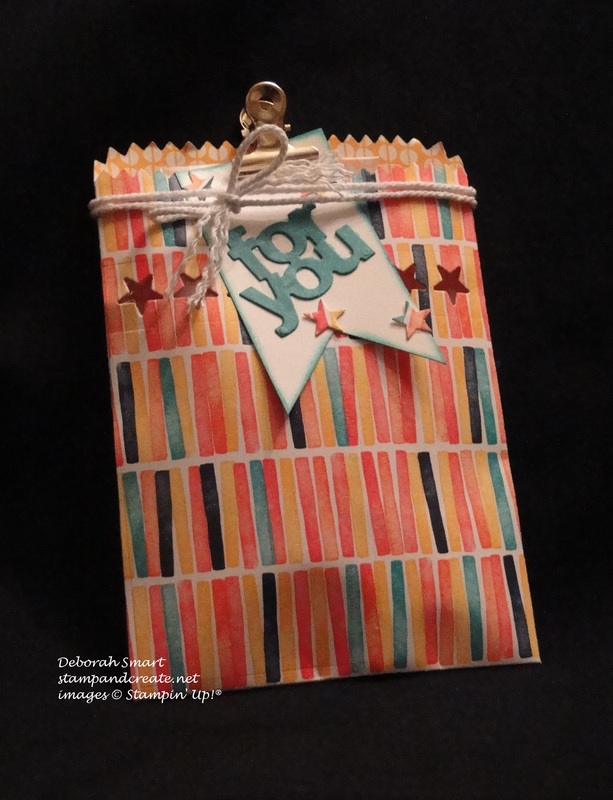 Once again using the Birthday Bash specialty dsp, I cut the Mini Treat Bag out using the thinlits dies and the Big Shot. I used Sticky Strip to attach the pieces together, then before closing up the sides & bottom, I used the stars border thinlit that comes with this dies set, and cut out the stars near the top of the bag. Once that was done, I closed up the sides & bottom – and that’s how easy it is to make the bag!! I took a piece of Whisper White card stock, and cut banner tails on one end of it. I used the ‘for you’ thinlit dies – again part of this dies set – and cut it out of Bermuda Bay card stock, then attached it to the tag using Glue Dots. Using the stars that were left from cutting the stars border, I glued them to the banner, then attached the tag to the Mini Gift Bag using one of the cute clips that came with the February Paper Pumpkin kit. A double wrap of White Baker’s Twine, and my little gift is complete! I hope you’ve gotten some inspiration for your next birthday celebration, and have seen how easily these sets coordinate with the Stampin’ Up! papers and embellishments. It really can be easy to create fabulous projects, with very little time! If you’re interested in purchasing the supplies I used for these projects, you can simply click on the image(s) below, and you’ll be taken directly to my online store. Before you head over the see what magic Jen has created for you, I hope you’ll leave a comment, and let me know how you’re enjoying the blog tour! I always enjoy your feedback! Just click the ‘Next’ button to head to Jen’s blog, or if you’d like to go back & have another look at Jennifer’s projects, just click the ‘Back’ button. Next Next post: Creative Blog Hop – Check it Out! Thanks so much for sharing your ideas, Deborah! Your card is so festive…love the gold embossing! 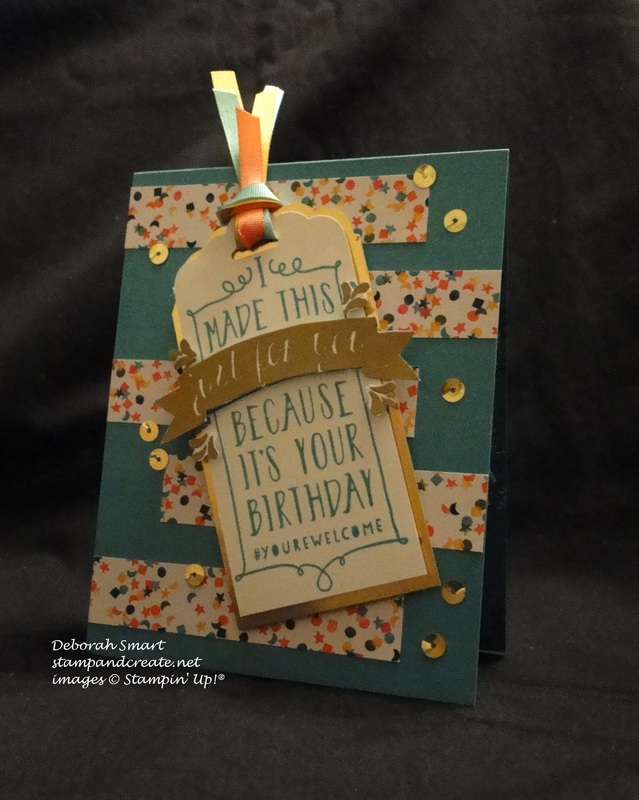 And, so much fussy cutting – always makes a card pop! Haven’t purchased the thinlit treat bag, but so many cute things can be done with it!